Tattered Angels has come out with some new and pretty impressive art mediums. Below are two of them called Glimmer Glaze and Glimmer Glam. Read below to see what Tattered Angels has to say about them. Glimmer Glaze will offer the same beautiful color and AMAZING glimmer as Glimmer Mist, but will now offer you the versatility to use on any surface. This product will be a translucent to a semi-opaque depending on how much of an application is used. Glimmer Glaze will also be a matte finished product if used in a fine application, yet as you build up the product the application will build up to a semi gloss or high gloss finish. This gives you an amazingly versatile product that can be used on any surface, offer any finish (matte, eggshell, semi-gloss or high gloss) as well as a variety of depth of color depending on how much you apply. 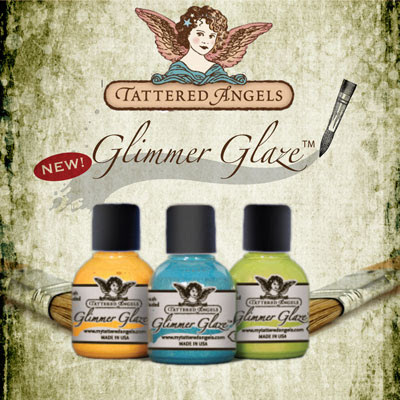 Glimmer Glaze will come equipped with a paint brush insert for easy application. The container will also have a nice sized opening making it easy to pour out for large project. Glimmer Glam will offer a similar base of Glimmer Glaze but with a slight more of a transparent color base, still have an AMAZINGLY GLIMMERY base, yet now we are adding custom glitters to add to the depth of the glimmery crafting experience! Using a ridiculous variety of glitters, we are not only customizing the glimmer in the product, we are now customizing the glitters too! This will give crafters a multi-faceted and unique art medium to work with. 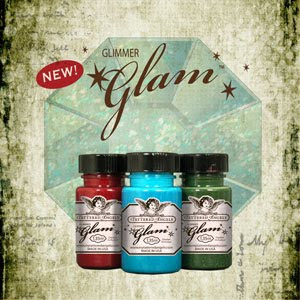 Glimmer Glam will come equipped with a pom like dauber for application. The container as well has a wide enough opening to allow crafters to use the product in larger amounts if needed. Both products are easily manipulated with Glimmer Mist, so they blend very nicely if needed. These products were created to act as a companion to Glimmer Mist to give additional depth to crafters Glimmer Misting experience. I am pretty excited to go and check these out at CHA and I will definitely let you know what I think! So stay tuned, so to speak. Yay, I would love to see how these look on projects! I can't wait to get my paws on these! Great ideas!! I would definitely try some of these out. I love the glimmer mist, but not real thrilled with the fact that is sprays on and its kind of messy that way. These should prove to be very interesting! i really want to try these. love this stuff, can not wait to go to craft store when these come out. I love everything Tattered Angels. Such innovative and cool product! It is like candy to me that I want one in every color!